The minute I saw the new fabric line from Riley Blake called Seaside I knew I wanted to remake my Every Which Way pattern in it. They're are some really cute florals in it but I decided to stick with the plaids, stripes and other geometric designs so that it would suit my "all boy" pattern perfectly. Of course, I do like things scrappy so I threw in a few other fabrics from a few other lines (just to mix things up). I'm loving the dark blue background this time. And the striped binding. These fat stripes make me happy. And the colors are so summery. I had so much fun remaking this quilt. These big arrows are so easy to put together. I got it done in no time! or if you just want the pattern you can get HERE in my Etsy shop. Very cute, I love the fun summery colors!! That looks awesome! Great binding too. I love this pattern...It's perfect for how I feel sometimes...like I am being pulled every which way. It's on my wish list/to do. 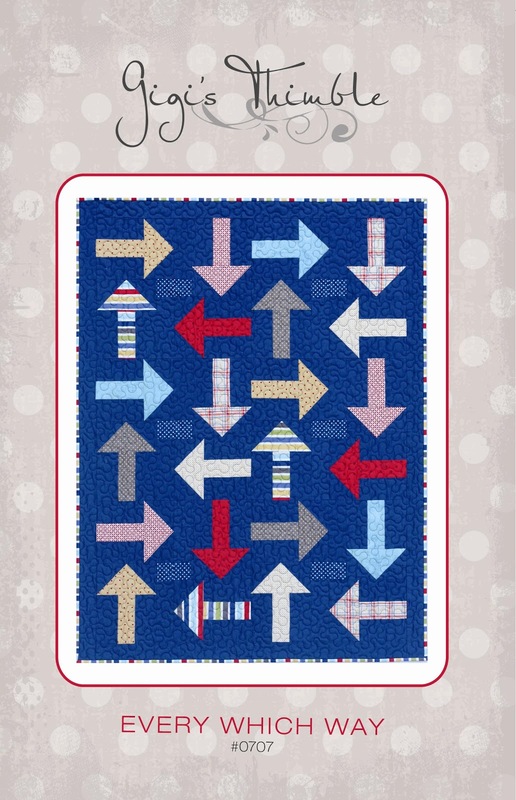 Very cute arrow quilt. The blue background was a great choice!